Mornings in our house tend to be a whirlwind of lunch and snack making, dishwasher emptying, hair brushing and racing the clock to get to school on time. My breakfast often consists of the scavenged remains of my kids’ bagels and apple slices. Alternatively, I wait until mid-morning to nosh, which often leads to unhealthy food choices. So when I read about overnight oats on Food52, I was excited to give the quick and healthy breakfast option a try. The directions sounded foolproof: Combine one part rolled oats with one part liquid in a jar, mix in a bunch of yummy extras, then put it in the fridge overnight. The next morning, just zap it in the microwave and breakfast is served. I tried it out this week using flax seeds, shredded, unsweetened coconut, slivered almonds and a little glug of maple syrup. It was delicious. The cute mason jar made it fun to eat, and it left me satiated until lunch time. I doubted my kids would like the oats, but I was wrong. 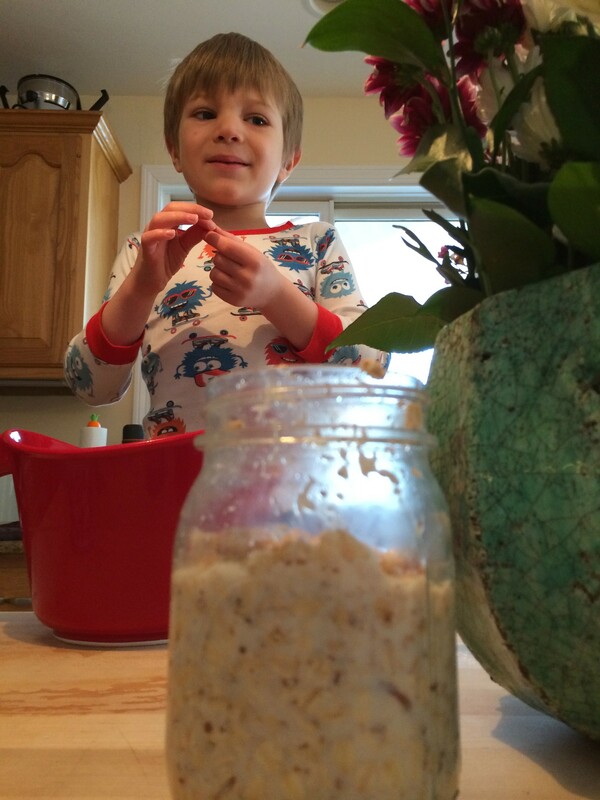 My 4-year-old son, Theo, insisted on sharing and then asked if we could whip up a jar for the next day. Knowing it would mean one less thing on the morning to-do list, I happily said yes.